I have no idea how long I've been wanting a spiralizer. I remember the first time I saw a recipe with zucchini noodles thinking that it was SO COOL! 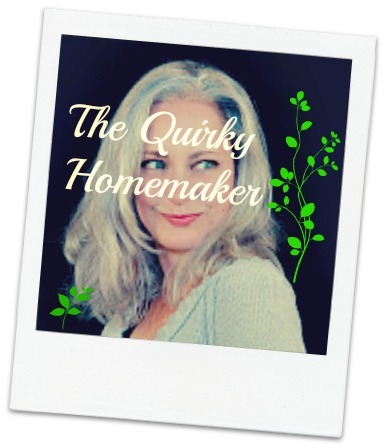 I thought at that time that I needed to get my hands on one of those spiralizer things! Months went by and I kept seeing more and more recipes, but for some reason I still hadn't taken that leap to get one. 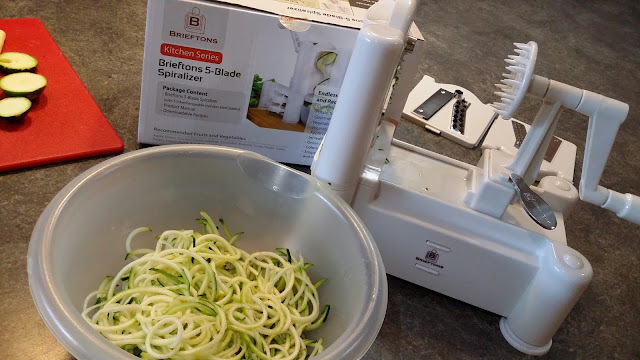 Luckily, I've recently been given the opportunity to try out Brieftons 5-Blade Spiralizer. 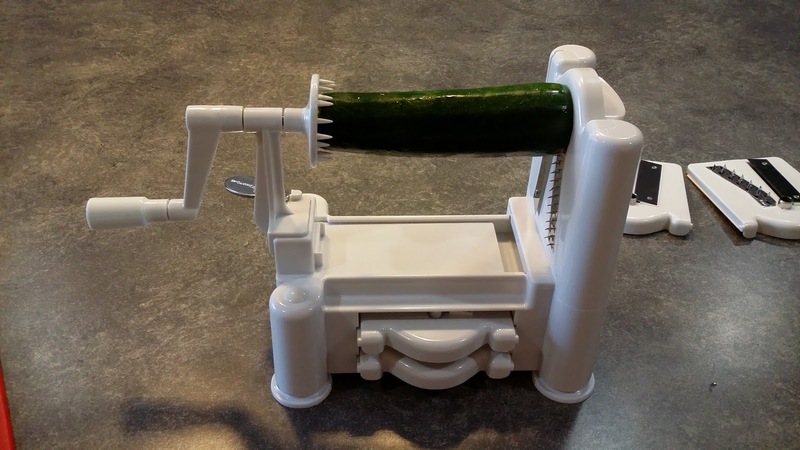 Disclosure: I received the Spiralizer for free in exchange for my honest opinion. All opinions are 100% my own. 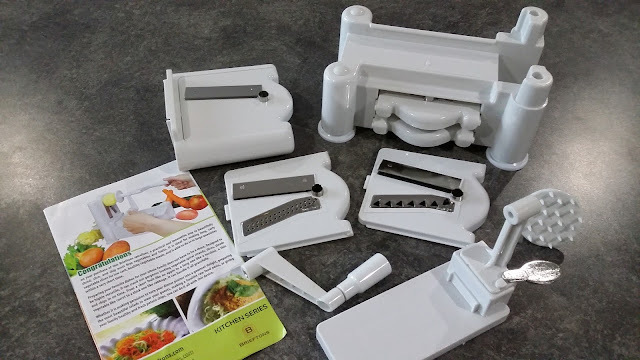 Brieftons 5 Blade Spiralizer comes shipped in a box (of course!) in a couple different pieces that need to be put together before you can use it. There's a base, a blade rack, the moving platform, the vegetable holder and the turning handle, plus the 5 different blades. And BONUS~~ they also give you a website address so that you can download a recipe ebook with healthy & tasty vegetable dishes!!! All of the pieces were fairly easy to put together. I was having problems in the beginning trying to get the blades in and out of the blade rack, but then I figured out a trick! The spiralizer is made from high quality, 100% BPA-free food grade, durable reinforced ABS plastic with ultra sharp stainless steel blades. The pieces are pretty easy to clean. Any of the flat plastic surfaces, I just rinsed and washed with a little dish soap. The blades I ran under water and brushed with my dish brush and then threw them into the top shelf of my dishwasher. 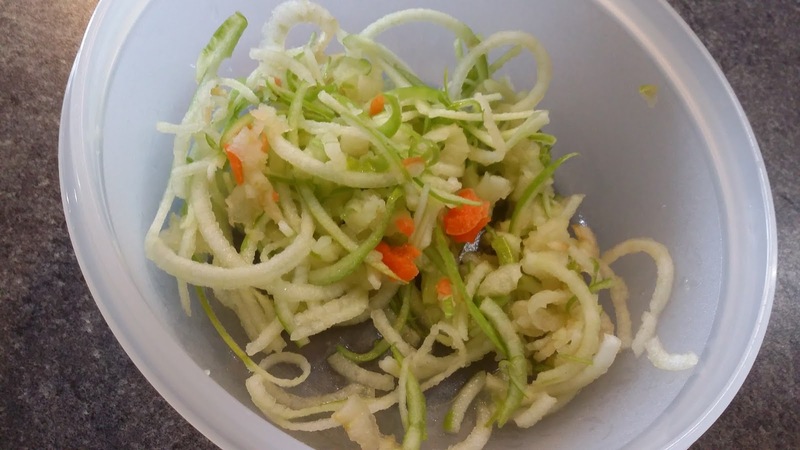 I used my spiralizer to make zoodles ~~ zucchini noodles ~~ but the spiralizer can be used on any hard fruit or vegetable that is up to 10 inches long and 7 inches wide. You can use it on potatoes to make curly fries, although I'm not sure you're supposed to use the largest blade to do that. Mine turned out a little wide and thin. The apples in the back in the picture below were done with the flat blade. I believe I would use that blade to make homemade potato chips or apple chips to dehydrate. I'm wondering if you can control how thick the slices are by pushing a little harder to make the spirals thicker? That will take a little more playing to figure out. The spiralizer actually makes quick work out of shredding, slicing and spiralizing. I really do think that this might become a very useful tool in my kitchen. 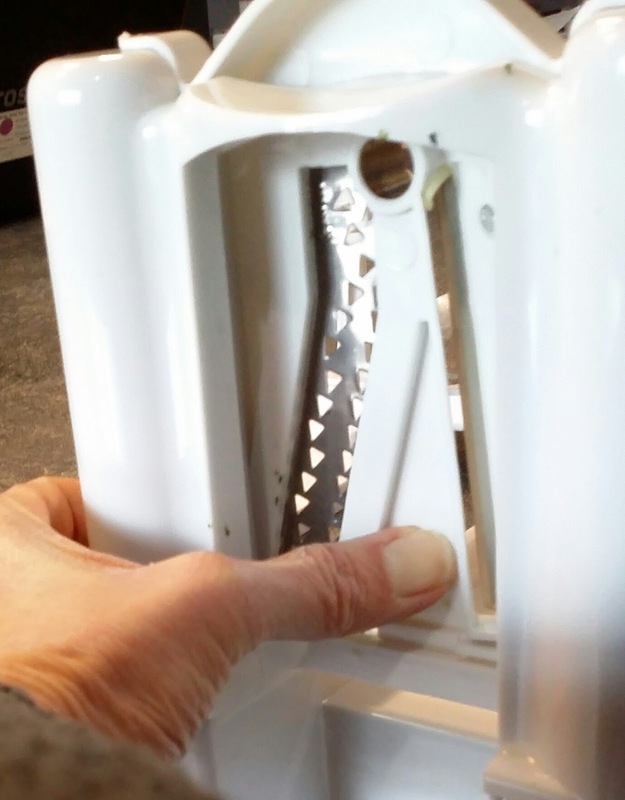 I tried out several of the blades and had so much fun I was searching for more things in my kitchen to spiralize. The picture below is green apple done with the angel hair blade. It definitely works better with hard veggies & fruits. 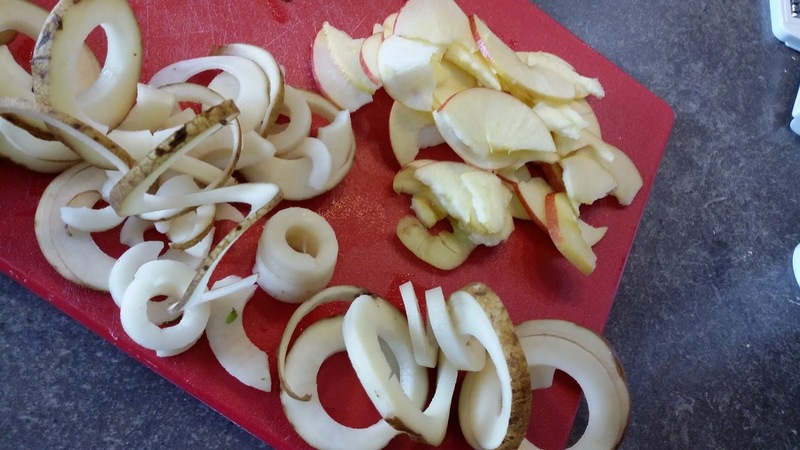 Although it spiralized my apple, it left a little pool of apple juice below the spiralizer. That didn't happen with the zucchini that I spiralized. The fruit or vegetable absolutely has to be a little longer. You can do regular carrots, but there's no way to do baby carrots because they're too short. That trick to get the blades to come out easier? Press on the back of the blade at the bottom~~there's a little circle right where you should put your thumb to press to get it to slide up and out of the blade rack easier. The only two things that I wish were different are that it could somehow contain all 5 blades. There are only spots to store 2 of the blades. I also wish that there was some kind of container or dish to catch the vegetables when they come out of the other side. You can watch my video review below! If you'd like to try making your own zoodles, the Brieftons 5 Blade Spiralizer is available on Amazon! 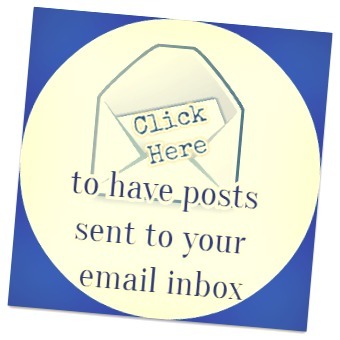 Have you ever tried a spiralizer? If so, what's your favorite recipe? That is such a cool looking machine. I've never seen anything like it before. The shapes it makes are so much fun. Who wouldn't want to eat their food when it looks so pretty.